Packing taught by the Professional Traveler Andy Graham, for Business, Trips, Tours, Resorts, Backpacking, Long Term, Europe, and Tropical or Cold. One day two weeks you need to pack every need, more than two and you pack what you cannot buy at the destination. Packing a suitcase - Sechan's video explains 15 good travel tips for packing your suitcase for an international trip. She is not from the USA. This is a checklist of the type of clothing you need pack, the essential clothing that you cannot easily buy abroad. Packing for travel by reducing volume in backpack by removing carton. I need to wander, and today I am packing my never return to Kara, Togo bag, with hopes of returning. After 14 years of travel, I have radically changed my packing method, it is strange. What to Pack for Travel, this pages explains Vactions, Resorts, Backpacker, Business and all of course the Perpetual Travelers. Packing is maybe an art, how does a person pack everything needed in one bag for a trip. Specific type of Travel Bags require different types of packing knowledge. Size of Bags or Luggage - I believe for safety reasons you should be able pick up one bag and hold above your hear for 10-20 seconds. If you cannot do this, you need to take special care for Taxis and transportation. - Approximately 40 liters and carried with shoulder straps on the back. - A small backpack worn on either the front or back, often coupled with large backpack and worn on front. - A wooden box, generally much larger than other kinds of luggage. Trunks come in smaller sizes as in the case of footlockers and larger ones called steamers. These days trunks are more commonly used for storage than transportation. Items large enough to require a trunk are now usually shipped in transport cases. - A general term that may refer to wheeled or non-wheeled luggage, as well as soft or hard side luggage. Wheeled Upright - A relatively new type of luggage that incorporates an extending handle that allows the traveler to roll it in an upright position. - A small bag, usually worn on the shoulder, though wheeled models with extending handles have become popular in recent years. - A barrel-shaped bag, almost exclusively soft side, is well suited to casual travel, with very little organization inside. A small bag, usually worn on the shoulder, though wheeled models with extending handles have become popular in recent years. The spelling of this luggage type "duffel" is also valid. - travel luggage traditionally made from carpets. - A hanging bag used to store shampoo, and other bath items. You need to know the volume and weight you desire to carry in each bag. First: Collect all the desired items in a box, then measure the space. Second: Place items in a plastic garbage bag and take to the Post Office and weigh the bag. Third: Do this for each bag you plan to carry, take care, not all airlines will allow you to check two bags, you need to check carefully with the airlines. Delicate Items: You need to place inside a container, maybe a plastic peanut butter jar, Tupperware, or something to encase the items. I carry lighbulbs by putting inside a plastic cup, the placing inside my plastic pitchers used for water dippers for shower. Multiple use Gear: Buy gear that provides your personal needs and multiple uses. And please not the needs of this website or what people recommend. Example: I get cold easy, and have a cotton hammock, I use it in three ways as a Hammock, Blanket and Curtain when the room curtain is not adequate. I carry this Hammock onto planes, it is bulky but I want it. Size or Volume: If you are looking at gear and trying to make a choice, the smaller the volume or size the better, then second concern is weight. Functional to Save Money: I carry cooking gear, it uses a lot of space, but saves me on average about 1-3 dollars per day in expense, and I am able to eat canned vegetables and be healthier. Generally, meals in restaurants do not supply the proper balance of vegetables. Three Month Rule: If I do not touch an items for three months, I leave it in the Hotel and say goodbye. Exception if the mosquito net, if you need it one time per year this is good. I did not pack my mosquito net for Europe and needed in an expensive Hotel in Brugges, Belgium. The building are older in Europe and did not have screens on windows. Nowadays the first thing I check is for screens, and often will tape a piece of mosquito net over the window to make a screen. Choosing Colors - Contrary to accepted advice that says to choose colors that do not show dirt. I recommend you wear the same clothes as you wear at home, you self-esteem is wrapped up in the way you dress, therefore it is important to dress normally. I learned this the hard way, after wearing dark shirts for a few years, I realized I was not as happy. I now wear white T-shirt and bright colored clothes as I wish. Footwear - You may need slip on, slip off sandals for Asia to enter and leave religious type businesses, the Buddhist, Islam and maybe Hindu have some rules on entering a house that says you need to remove shoes. Other than that, wear what you think you need. Roll your Clothes - I recommend this for trips longer than one month whereby you need to carry more gear. For short "Tourist Trips" I recommend you buy an oversize bag and have tons of extra space so you can pack faster. Rolling clothes is time consuming, when I move between cities I buy a big grain bag and tie it on the outside of my backpack. When I fly to the USA or other continents i will roll my clothes up extremely tight with the risk of breaking my zippers on the backpack. Zip Lock Plastic Bags - You can store wet items in these bags, but you need to double or triple bag the items. For normal small things I recommend you use school children's pencil bags. Rain Poncho - Pack if you plan on walking long distances. Umbrella - Always pack or buy. Buy upon Arrival - Packing Light - You can buy in any Country. 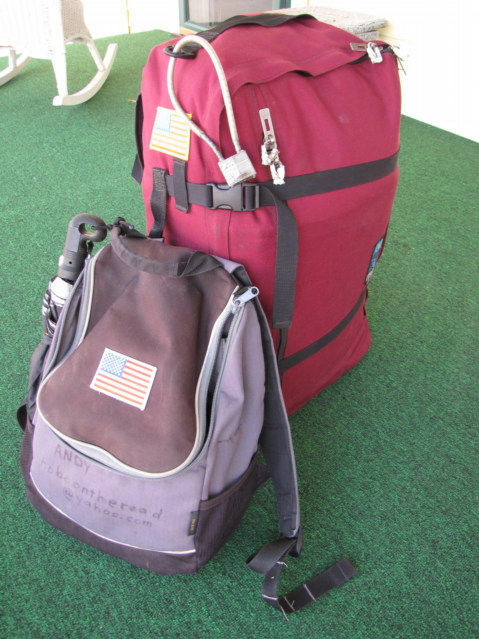 Note, the idea of packing light is semi-stupid, everyone packs light, all traveler carry what they believe is necessary. If you pack light at the expense of your happiness you are being silly. Carry all and any items that make you happy up to the limit of the space. Cell Phones 90 percent of the planet cells one for 20-30 Dollars with a prepaid SIM card. Extra Bag or Tote to haul purchased Items home, and probably very cheap. - The same list as above to buy in the country, you may want to dump your a few shirt and replace with souvenirs. What you will buy, and tell yourself you do not need. - No metal, that is too simple. 043 How To Protect Things You Packed. What does Andy Graham the HoboTraveler.com Pack?